This pen body came in my last order from JetPens about a month ago, and I haven't stopped using it since it arrived. I was a bit hesitant about using the Coleto at first because of previous bad experiences with multi pens. This pen more than reversed the negative stigma I had about multi pens. I ordered the 0.4mm Violet and Red refills for the 3 pen Coleto. ( I only ordered two because I mistakenly thought that the pen came with a refill in it) These Hi-Tec-C refills write exponentially better than the G-Tec-C4. The G-Tec-C had three problems that prevented it from being one of my favorite pens. 1. The pen took a lot of furious scribbling before it started writing. 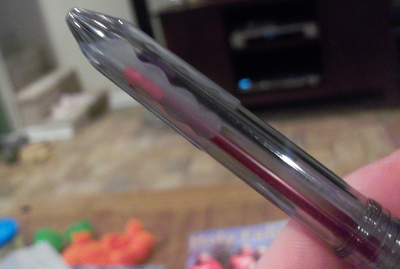 (This is a major pet peeve for me when it comes to pens. ) 2. The grip of the G-Tec-C was ridged and dug into my fingers while I wrote. 3. The body of the G-Tec-C was very cheap and broke very easily. The Hi-Tec-C Coleto presented resolutions to all 3 of these problems that I noticed in the G-Tec-C. The Coleto writes without requiring scribbling, has a very comfortable grip and a sturdier body. 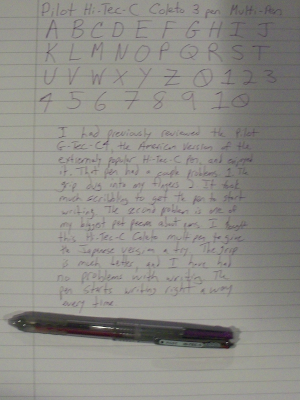 The Hi-Tec-C refills did not require any scribbling to start and have written well every time that I used it. The violet ink is a rich purple color that is pleasing to the eye. The red ink is a bit pale for my liking, but that is not very important as I only use it for underlining things. The body of the pen is great. This pen body was $2.50 and is a thicker cylindrical tube than the G-Tec-C (to be expected with the additional pen refills inside the body.) The body isn't overly thick and feels very comforatable in my hands. Also it hasn't broken in my pocket like the G-Tec-C did. The grip on the pen is also a vast improvement on the G-Tec-C's ridged grip. Instead of ridged plastic there are 4 wavy grip strips placed vertically around the tip of the pen. They are very comfortable and keep your fingers right where you want them without any fatigue to your hand during long writing sessions. Once the pen starts to write the writing experience of the G-Tec-C and the Hi-Tec-C coleto refills are the same. However, the Coleto does not require any scribbling to start. The grip, body, and refills are all better than the G-Tec-C. This multi pen has definitely planted itself firmly on my list of favorite pens. 10 out of 10 mummies.